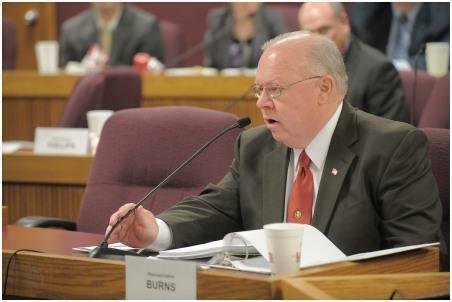 State Rep. Bob Burns is facing calls for his resignation after he called into Bob Romanik's radio show multiple times. In March, for instance, Burns, who is a Democrat, called in and said: “I’m proud of you for standing up for our veterans. You do it with your actions, not just your words.” And state Sen. Maria Chappelle-Nadal, D-University City, posted a YouTube video where Burns called in to Romanik after the host used the N-word to refer to African-Americans. After that video started making the rounds on social media on Saturday, House Minority Leader Gail McCann Beatty released a statement calling on Burns to step down. The Kansas City Democrat said “while we acknowledge some of the recordings have been edited, the fact that Rep. Burns repeatedly called into this show is reprehensible given the host’s well-known racist views.” Later on Saturday, Missouri Democratic Party chairman Stephen Webber called Burns' actions "indefensible," adding that he believes the lawmaker should resign. State Auditor Nicole Galloway and U.S. Sen. Claire McCaskill also released statements calling for Burns to step down. Burns worked as a staffer for McCaskill for three years, according to his House biography. Burns told St. Louis Public Radio on Monday that he's not resigning, and that his comments on Romanik's show were edited in a way that makes him look bad. "They have tapes of me talking, [and] a lot of those tapes - I believe all of them have been spliced, so it makes me look like I might be agreeing with him," he said. "But he'll say something racist and I'll say, 'but on this veterans' issue'...you can tell they've been spliced together." McCann Beatty has stripped Burns of all his House committee assignments. "I don't like that, but that's her prerogative," he said. He also said that some African-American lawmakers are supporting him, despite the Missouri Legislature Black Caucus demanding his resignation. "They know my heart, they know I'm not a racist," Burns said. "I believe we're all God's children; that's the way I was taught in Sunday School and in church, and that's the way I've lived my life." Before entered state legislative politics in 2012, Burns spent several decades as a Teamster’s labor union. He was a key player in successfully disincorporating St. George, a small town in south St. Louis County. After an unsuccessful state House bid in 2006 against then-GOP Rep. Jim Lembke, Burns won an open state House seat in 2012 that takes in parts of St. Louis and St. Louis County. Since that district is heavily Democratic, he’s faced only token opposition since he won his first term. Burns is unopposed for re-election this year. This isn’t the first time a local politician got in hot water for appearing on Romanik’s show. In 2016, St. Louis Board of Aldermen President Lewis Reed had to apologize for not doing enough to challenge Romanik when he appeared on his show. Romanik had made disparaging comments about Alderwoman Megan Green, a 15th Ward Democrat who clashed with Reed over the funding of a NFL stadium. Green, who is running against Reed next year for Board of Aldermen president, alluded to that incident in a tweet questioning why McCaskill hadn’t spoken out back in 2016.